Throne of Glass (Throne of Glass #1) by Sarah J. Maas. Publication : August 7th 2012 by Bloomsbury USA Children's. BEST book of 2012! Seriously, Throne of Glass is my favourite book of 2012 despite the heavy competition. Celaena Sardothien is the deadliest assassin in all of Adarlan, or was, until she got caught. Having spent a year working in imprisonment in the salt mines at Endovier, something that borders on a miracle happens - she's offered a second chance at freedom. Celaena must enter a tournament as Prince's Dorian's champion and compete against other assassins, thieves and soldiers from all over Adarlan and the last one standing becomes the king's personal champion - a fancier term for a royal assassin. If she wins, she gets to be free after 4 years of servitude to the king. Not exactly an appealing offer but it's Celaena's only shot at freedom..so, she takes it. After reading the blurb of Throne of Glass, I expected something like Grave Mercy but this was so much better! It's not just the world-building that sucked me in; the story and the characters are fantastic on so many levels! Celaena's got to be my all-time-favourite book-heroine, right after Rose Hathaway. She has had a brutal childhood, she's a a killer and yet, there's something innocent/naive about her that makes her so adorable. I read this in one go by staying up until five in the morning and it's not everyday that happens. I can't gush enough about the characters, they've been portrayed beautifully with such depth that while this is a fantasy novel, you notice that there's something realistic about them. I'm rooting for Prince Dorain all the way! Those of you who normally hate love triangles will change sides after reading this book, it's that good. 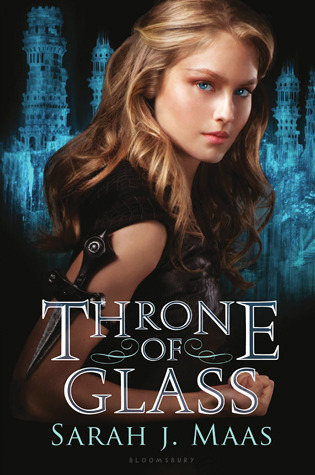 Throne of Glass has a more fairy tale feel to it along with the fantasy. The magnificent world, loveable characters and excellent storytelling makes Throne of Glass a book that must be read by every young adult! I absolutely cannot wait for the sequel! I've seen this cover ALL over the place but never read the blurb. Sounds like my kind of book. Your raving (LOVE that video clip BTW) just talked me into go purchasing it. I am inclined to agree with you, I started the novellas and it is addictive. I can't even imagine Celaena to be 16!